In this episode I answer two listener questions about TRACON while navigating VFR ... and ... bring you an excerpt from my recent talk at Sun and Fun called, "Ten Things All Pilots Should Know". For the complete talk please visit Patreon.com/learntfp. Please enjoy The Finer Points! In this episode I give you 3 tips to try on your next flight and discuss whether or not it's appropriate / effective to train in a complex aircraft for your Private. Please enjoy The Finer Points! On this episode, we talk with Canadian Air Traffic Controller, Ryan Van Haren, to learn some of the common mistakes made by US pilots crossing the border to the north. Learn tips that apply to all border crossings and how to avoid making these same mistakes yourself! These podcasts are listener supported by the generous donations of our Patrons. Patrons receive extra benefits (including minimally edited lesson videos) for helping to make these free podcasts available to everybody. We also talk with Harry from the UK about some differences between the FAA and EASA. Lastly, I'll give you 5 tips for working in crosswinds. This podcast answers some listener questions on flying in IMC and when to use additional CFIs and also includes additional info on how to fly the Special Flight Rules Area through the LAX class B airspace. This podcast covers how that process works. Please enjoy The Finer Points! These podcasts are listener supported by the generous donations of our Patrons. Patrons receive extra benefits (including minimally edited lesson videos) for helping to make these free videos available to everybody. In this podcast I will answer some listener questions and read a piece I wrote that carries forward lessons that can be learned from the R.M.S Titanic. Yes, the steamship that sank over 100 years ago. What could this possibly have to do with aviation? Well, you'd be surprised. Please enjoy The Finer Points! In this podcast we talk with the spin doctor, Rich Stowell, about the nature of stalling in a turn. Please enjoy The Finer Points! These videos are listener supported by the generous donations of our Patrons. Patrons receive extra benefits (including minimally edited lesson videos) for helping to make these free videos available to everybody. In this podcast I answer 4 listener questions from Instagram and Facebook. 2. Emergency Landing on Highways? 4. Relative Humidity on performance charts? *Special Thanks to Michael Bizar for providing the music. All of the music in this video is composed and performed by Michael Bizar. 1. In training - how much is "too much" iPad? 2. Will you please do a podcast on how to operate the radios in a more effective way? You, too, can send me questions on instagram @learntfp. Please enjoy! PIREPs are some of the most valuable weather information we can get as pilots. Forecasts are forecasts, METARs are surface condition, but PIREPS are in flight reports of weather that pilots are actually encountering. In this podcast we review how to contact Flight Service to issue a PIREP. A great review for all pilots! *Special Thanks to Michael Bizar for providing the music. All of the music in this podcast is composed and performed by Michael Bizar. In this podcast I answer a listener question about if (and when) it's ever OK to skip your check list. This listener found a flight school that specifically AVOIDS the use of check lists during primary training and wanted some deeper insight into the validity of this technique. There is a video version of this podcast available at The Finer Points YouTube channel, come check it out! In this podcast I talk with pilot, Tyler Duffy, who experienced a total engine failure on his second solo flight. Hear the actual ATC audio, listen to my conversation with Tyler, and learn what you can from this valuable experience. The questions answered in this podcast came from listeners on Instagram. We cover how to get ahead as a CFI, which is the best training airplane, and Part 61 vs Part 141 ... and much more! You can find me on Instagram @learntfp. 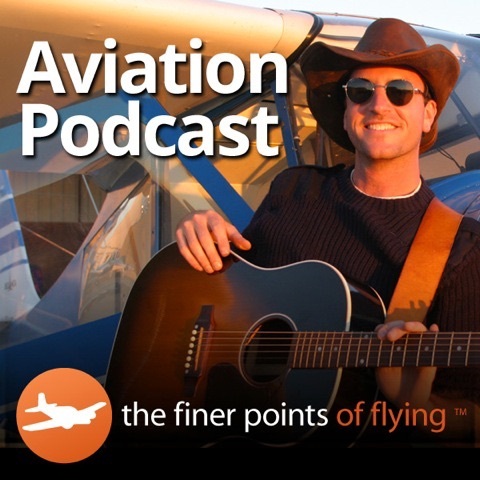 In this episode I talk with Cory Robin, Jason Sneed, and Kevin Quinn - three STOL pilots who are part of the group known as the "Flying Cowboys". This episode was recording live at Oshkosh 2018 and was arranged by Cory Robin, founder of the Flying Cowboys. We discuss everything from "what is STOL" to best practices for off airport landings. Please enjoy The Finer Points! You can find the Flying Cowboys on Facebook. In this podcast we talk with expert flight instructor, Rod Machado. This conversation includes many topics including what to avoid when looking for a good CFI, how to vet instructors properly, and how to navigate the forest of online instruction. Please enjoy The Finer Points! In this podcast we hear an example of how to file an IFR flight plan with flight service while in flight. The days of your "pop up IFR clearances" might be over ... Fly Your Best! In this podcast Peter and I discuss ditching. This is part II of "How to Crash and Airplane". Please enjoy The Finer Points! In this episode we talk with Peter Lert, a former Burt Rutan test pilot who spent many years ferrying airplanes across the North Atlantic. Peter has over 20,000 hours of flight time and 50 North Atlantic crossings under his belt and on this episode he relates his experience of crashing an airplane and what he did to make it survivable. Join me as we talk with Dr. Howard Donner about the art of instruction. We review the laws of learning and talk strategies for teaching people how to fly from the basics on up. In this podcast we talk with Rod Rakic about the fact that recreational drone operators are not bound by Part 107 UAS laws. In fact, they are not bound by much at all. In this episode we talk with Lt. Nate Gilman, a SARSAT operations officer, who informs us it is not longer appropriate to check your ELT in the first five minutes of the hour. Ever. In this episode we discuss a specific tool you can use to think in front of the airplane. Fly Your Best! In this episode we discuss wake turbulence encounters and avoidance procedures. We dig deep into the concept of "practical drift" when it comes to safety procedures. Fly Your Best! In this podcast we discuss upset recovery training strategies with Rich Stowell (http://www.richstowell.com/). Learn tips for your next training mission. In this podcast we discuss some of the finer points of flying and how experience with horses can benefit you there. We also cover some basic tips on how to have a light touch on the controls and stay ahead of the airplane. In this podcast we look at some of the confusion that exists between practice instrument approaches and pop up IFR approach clearances. Recently a Cirrus SR22 was destroyed in a landing accident likely due to wind shear. Any one of us might have ended up in this situation and in this podcast I will review three strategies this pilot might have used to avoid this accident. Fly Your Best! In this episode we discuss the delay factor when a pilot experiences an actual in flight emergency. Fly Your Best! In this podcast we tune into AOPA's Hangar Talk podcast in which I discuss our mountain flying trip with AOPA author, Jill Tallman. Please enjoy The Finer Points! I hope you're hungry aviators because this podcast is food for thought. In this episode I recall a story from a trip to Oshkosh in years past that left me, well, let's just say surprised. Learn from my mistakes and fly your best! In this podcast we pick up a conversation from Facebook and discuss a procedure for briefing a VFR arrival. Working to keep your flying standard and your procedures bullet proof. Fly Your Best! In this podcast I will give a simple standardization for your Cabin Check that will increase your knowledge of your systems and add safety and redundancy to your flying. Fly Your Best! On this episode we answer a question from Melbourne Australia regarding how to best maintain directional control during the takeoff roll, especially in a cross wind. Fly Your Best! In this podcast we review techniques for staying ahead of the airplane under IFR. Fly Your Best! In this podcast we discuss tactics for excellent flight reviews. We use a recent flight review I did with Steve Thorne from the Flight Chops YouTube channel. Fly Your Best! In this podcast I will give you 5 strategies that i used during my ATP training to save money and make the dual instruction as efficient and effective as possible. Fly Your Best! On this episode of TFP we talk with ForeFlight weather scientist, Scott Denstaedt about icing. Scott is a former meteorologist, CFI, and active pilot who flies all over the U.S. We discuss strategies for avoiding icing conditions and tips for getting out if that proves impossible. Here they come Aviators! The number of student pilots is way up and in this podcast we discuss some thoughts on how we might retain them. In this episode we take a closer look at a fatal accident involving a TBM700 and an encounter with ice. We look for takeaways here that will help other pilots avoid the same mistake. Fly Your Best! In this podcast with talk landings with Qantas airlines Captain, David Jacobson, developer of the Jacobson Flare. Capt. Jacobson has developed a scientific and practical technique that allows you to accurately determine the flare height for any aircraft from Cessnas to Boeings. Please enjoy The Finer Points! On th is episode of TFP we talk with filmaker pilot Steve Thorne of Flight Chops. Steve talks a bit about how Flight Chops started and how the show is developing. If you are a fan of Steve's awesome videos listen to this podcast to hear our exclusive interview! In todays flying environment there is a massive amount of information available to pilots. Sometimes too much. It can be hard to know what to pay attention to and what will be avialable in flight. About two weeks ago a pilot left Concord, CA and collided with terrain while trying to fly VFR to Reid Hillview, CA. In this safety session we discuss this accident and the take aways for the rest of us so that we can avoide making the same mistake. In this episode of TFP we review two procedures that have no purpose or place in the airplane. Fly Your Best! In this podcast we discuss circuit breakers and correct a mistake from a previous podcast on electrical systems. We hear a clip from electrical engineer, Tom Byrne, that will help the average pilot understand circuit breakers. Fly Your Best. A continuing discussion about the potential dangers that exist during the base to final turn, which is the most hazardous portion of the traffic pattern. Fly Your Best! In this podcast we hear a real oceanic position report and learn an acronym to make sure you're ready if ATC every tells you to 'resume normal position reporting'. Fly Your Best! In this podcast you will learn some tips for nailing crosswinds that you can test out on your next flight. All you need is an Expo pen. The approach clearance is very significant for a lot of reasons. In this podcast we'll talk about those things and give you tips that will allow you to be more prepared and more expeditious with your readback. Fly Your Best! Listen to in-flight audio and learn techniques for filing VFR flight plans. Search and rescue is a free service offered to pilots. Unfortunately, in VFR flying it is rarely used. Perhaps this is because pilots are not familiar with the filing process. Well ... worry no more. This episode clears that up! Please enjoy the finer points. In this episode will learn a tip for landongs that will help you perfect your technique and opyimize your upgrades to new makes and models. Fly Your Best! In this podcast we continue last week's discussion on CG loading with a reminder about the weight shift formula. Sometimes passengers ask to shift weight at the last minute and this handy bit of math will leave you prepared to give an honest answer on how that effects aircraft loading and CG location. Fly Your Best! In this podcast we are going over the legal requirements for filing an alternate with your instrument flight plan. You may know the 1-2-3 rule but the finer points go well beyond that. Fly Your Best! In the latest episode of The Finer Points Aviation Podcast, I'll explain induced drag and how to best discuss this topic on a flight test or flight review. Fly Your Best! In this aviation podcast we review the ins and outs of linear scaling of your CDI on the GPS when operating under IFR. Know your technology and Fly Your Best! On this episode of TFP we discuss a few tips that might make you a bit more efficient and bit more effective. Please enjoy The Finer Points! On this episode of TFP, pilots who fly with the G1000 glass cockpit system will get 3 tips to try out the next time they are in the airplane. Please enjoy The Finer Points! In this flight training podcast you will learn 3 standard operating procedures for your flying that will make you a better and safer pilot. 3 things you should NEVER do in an airplane. Please enjoy tfp and Fly Your Best! Nail your check ride ... on the first shot. In this aviation podcast we complete our discussion about the special emphasis areas on ALL check rides. In todays environment more and more pilots are flying IFR direct via GPS. This means long straight cruise legs followed by extremely busy low altitude approaches. Its all too easy to let the airplane lull you into a sense of complacency. In this podcast we discuss how IFR flying is like the greatest fight of all time. Fly Your Best™! In this episode I'll tell you a story from the flight line last week where I lost 4 quarts of oil in 1.4 hours. A near engine failure. Fly Your Best! At Sun and Fun 2014 I had the honor of interviewing Maj Mike Van Wyk, pilot of the Blue Angels C130 'Fat Albert'. In this episode Mike tells us a bit about how the Blue Angels achieve a high level of excellence and what it takes to be a member of the team. Please enjoy The Finer Points! In this episode we review those special emphasis areas from the PTS. These are things the examiners are trained to look for ... make sure you've considered them. Regardless of whether or not you have a flight review, check ride or Open Airplane checkout coming up ... a review of these items are like vitamins for the proficient pilot. In this episode I'll share some feedback I received about the discussion with Mike Busch regarding whether or not to perform routine idle checks. In this episode we review L/Dmax, Lift, Drag and some of the finer points of Aero dynamics. Please enjoy! Learn a few acronyms to help you call up the equiptment required by 91.205 anytime you need to. Whether you are determining if you can fly in the face of failed items or preparing for a check ride this podcast will help. Fly Your Best! Learn to remove the 'noise' from your flying. Simple is safe. Some thoughts on that this week on TFP. Please enjoy ! It started as a normal VFR flight and ended in multiple approaches at an airport where the weather was 0/0. Please enjoy The Finer Points! In this podcast we talk with Howard Donner about some of the issues he is encouternering while training primary students the very basic skills. A great dialogue that will help any pilot consider the finer points of landing. Please enjoy TFP! Winner of the 2013 AOPA Let's Go Flying Award, Greg Brown, in a classic TFP interview. Please enjoy The Finer Points! In this episode we review HIWAS, FSS Freqeuncies, Flight Watch, TWEB and more. Please enjoy TFP. A student on Facebook asked what the heck instructors mean when they say, "Pitch plus Power equals performance". In this episode I do my best to explain ... Please enjoy TFP! In this episode Howard Donner interviews me about some of the concepts introduced in my ibook, "Setting the Standard". Please enjoy The Finer Points! In this episode I will pass along a training technique for the cockpit that will help you and your CFI perfect your stick and rudder skills. Fly Your Best! Some practical tips on how to save $$ in training. Fly Your Best! In this episode you will ride along on an Instrument flying lesson to learn some tips on how to stay ahead of the airplane. Fly Your Best! In this flight training podcast mail call I answer questions about presidential TFRs and long straight in approaches. Fly Your Best! Every pilot has heard, "MORE RUDDE"' from your flight instructor. Take a moment to review the concepts behind why rudder so important. In this flight training podcast you will learn a bit more about ruder use. Please enjoy TFP! On this episode of TFP we take a closer look at the 'idle check' and leaning procedures on the ground. Our special guest is Mike Busch from www.savvymx.com. Please enjoy tfp! In this epsisode we talk with former executive director of the National Association of Flight Instructors (NAFI) and designated pilot examiner, Jason Blair. Jason gives us some insight, from an examiners perspective, on how we might best approach a check ride. Please enjoy TFP! In this episode we talk with Dr. Howard Donner about the finer points of the new 406 mhz ELTs. Please enjoy TFP! A fan recently asked if there are any safety sessions available on continued VFR flight into IMC ... so here it is, aviators! From allllll the way back in 2006, let's revisit TFP safety session #1. Please enjoy TFP! Hello Aviators! This week we are reviewing the ingredients and life cycle of Thunderstorms. Please enjoy TFP! In this episode we discuss a message from a facebook fan about an actual engine failure on final. We're learning from each other's mistakes this week on TFP! Please enjoy the finer points! In this episode we review some of the basics of preparing for a possible engine failure. Fly Your Best! Considering and instrument rating? I recently received a facebook message from a fan who asked about when it's appropriate to start working on approaches during instrument training. Here are some thoughts ... please enjoy TFP! In this episode I share a story about an adventure training trip to the Pacific northwest. After many days of flying fatigue and other factors contributed to an engine failure on final approach! On the Aviation Safety Sessions we learn from each other's mistakes! Please enjoy The Finer Points! On this episode of TFP we're reviewing advection fog. We cover how it forms, why it forms and how to predict it. Please enjoy The Finer Points! In this episode we are reviewing some of the finer points of how to clear your aircraft windows. If you are a renter you can look forward to clear windows ... if you are owner you get those and also maintain the value of your aircraft. It's not about Pledge and it's not about Prist. Listen to this weeks episode to find out how the Pro's reccommend cleaning your plastic windshield. You might be surprised. Fly Your Best! Learn how understanding seatbelt lawe can reduce your risk of collision. In this episode of TFP we review some of the finer points of arriving on the runway intact. Please enjoy The Finer Points! This week we pick up the discussion on whether or not to EVER use the phrase 'Any Pilot's In The Area, Please Advise'. Fly Your Best! Welcome back aviators! In this flight training podcast we discuss how to effectively check your electrical system before you fly ANY airplane. Please enjoy the finer points! On this episode we're talking with author of 'Say Again, Please', Bob Gardner. Bob has more than 40 years in the aviation industry and he is widely considered an expert on radio communications. On this episode of TFP he gives away some secrets on how to perfect this part of your art form. Please enjoy The Finer Points! In this episode we discuss common errors and how you can perfect your skills by avoiding the common mistakes. Please enjoy The Finer Points! In this episode we talk with AOPA author, former airline pilot, world speed record holder and internationally reknowned aviator, Barry Schiff on what makes a pilot great. Hello Aviators. On this episode of TFP we are discussing low pressure weather systems. Please enjoy The Finer Points! On this episode of TFP i'll give you the criteria that I use to make the sometimes tricky IFR go / no go decision. Fly your Best! In this episode we hear clips from the audio instruction CD, 'The High Air Work'. In depth discussion on Approach to landing (Power off) stalls and go arounds. Please enjoy The Finer Points! On this episode of TFP we review Class Charlie radio communication procedures. Please enjoy TFP! This is part II of a series on DME arcs featuring tips and tricks that help assure you are proficient with the visualizations associated with this procedure. Please enjoy The Finer Points! In this episode we take a look at how to effectively visualize DME arcs on your flight instruments. Although rare, these maneuvers do occur in the real world and are a part of the instrument rating curriculum. Take a moment to review them and learn some tips on how to always get them right. Please enjoy The Finer Points! In this episode I tell you about a learning experience that I had over the summer while flying into the Grand Canyon at night. The complexities of the real world are often hard to re create in training. In these Safety Sessions we share our stories so that we may learn from each other and avoid repeating each others mistakes! Please enjoy TFP. On this episode of TFP we cover how pilots might standardize their procedures across IFR and VFR flight operations. Please enjoy The Finer Points! In this episode we hear from a listener with some questions regarding Adverse Aileron Yaw. Please enjoy The Finer Points! On this episode of tfp we are looking at upgrading to an electronic logbook, specifically LogTen Pro. On this episode of tfp we discuss common stall / spin scenarios that get pilots into trouble on both approach and departure. Please enjoy The Finer Points!! On this episode of TFP we discuss standard operating procedures for general aviaiton pilots and how they might help keep you alive in the airplane. On this episode of tfp we look at the finer points of using rudder to compensate for adverse aileron yaw. A few practical tips to help you fly like a pro. On this episode of TFP we are taking a closer look at Induced Drag. You will learn how it works aerodynamically, how to discuss it and how it relates to ground effect. On this episode of TFP we discuss how to achieve excellence in training and successfully prepare for and pass your FAA check ride on the first attempt. On this episode of The Finer Points we discuss why maneuvering speed changes with weight. Fly Your Best! On this episode of The Finer Points we are discussing VFR radar services, or VFR flight following, and VFR flight plans. We will discuss who provides these services, the operating procedures and protocol and clarify how these two services provide very different things. Please enjoy The Finer Points! This week we wrap up our 2 part question and answer series with Max Trescott. Please enjoy The Finer Points! This week we begin a two part 'Question and Answer' series with Max Trescott. Write to us with your GPS related questions and hear Max answer those questions on an episode. All submissions due by September 16th, 2009. Please enjoy The Finer Points! Stall Speed often varies with bank angle. Understanding this variation will help us be safer pilots. This week on TFP we discuss load factor and how stall speed varies with bank angle. Fly Your Best! This week on TFP we review the highlights of the arrival procedure to the greatest celebration in aviation, the EAA's AirVenture at Oshkosh, Wisconsin. Use this file as a last minute audio review as you prepare to fly into the show ... or couch fly the procedure from the comfort of your own home, if you can't make it this year. Please remember to keep your eyes out for other traffic and as always, be safe and fly your best! Normal Podcasting will resume on August 7th upon our return to California. This week on The Finer Points we listen in on select highlights of a live radio broadcast from the broadcast headquarters of Sun N Fun Radio. In this episode we talk with a 400 hour commercial pilot, Dave, who holds an instrument rating and flies out of the Pheonix Arizona area. Dave tells about a close encounter he had with a runaway autopilot. Please enjoy TheFinerPoints! This week on TFP we discuss the difference between True and Magnetic with an emphasis on how it relates to wind forecasts and reports. Please enjoy The Finer Points! This week on The Finer Points we will discuss turbocharging systems on aircraft engines. We’ll cover the purpose, basics of operation, and a few different types of systems that you might see in turbocharged airplane engines. This week on The Finer Points we will discuss the nice to know details on VFR Sectional Charts. The sectional has a lot of great information on it, if you know where to look. Please enjoy The Finer Points! Hello Aviators! This week on TFP we talk with student pilot Robert Schorr, student pilot. Robert has been having difficulty with his landings during 'calm wind' days and not so much in cross winds or head winds. Hello Aviators! This episode of TFP will analyze the process of ditching. Sometimes ditching on water is our only choice in an emergency situation. Hello Aviators, This week we will discuss unpowered flight. Understanding flight without power will help make us well rounded, safe pilots. Hello Aviators! This week on the Finer Points of Flying Podcast, weâll start a discussion about the transition from one engine to two, multi-engine flying. This week on TFP we talk with Paul Craig, author of a revolutionary new book by ASA, that combines private and instrument training. Please enjoy The Finer Points! This week on the Finer Points of Flying, weâll discuss why mountain flying deserves special considerations. Get ready for some fun and rewarding flying! This week on TFP, weâre back with another Safety Session. We will examine an NTSB report with hopes to learn from others and inspire conversation about how to make ourselves safer pilots. We'll be talking about carburetor ice, how it forms and how to prevent it. Please enjoy The Finer Points! This week we consider the value of endorsing students for solo flight in class Bravo airspace. Please enjoy The Finer Points! This week on TFP we cover the basics of High and Low pressure systems. Review your weather theory this week on The Finer Points! In this podcast we review some basic distinctions regarding VSpeeds and have a visit from ForeFlight co-founder, Tyson Weihs. Happy Holidays! This week on TFP we look at www.fs-mp.com, a multi player online group of pilots that participate in a very realistic virtual world. Please enjoy The Finer Points! This week we look at an accident that could have been prevented. Improve your flying safety with The Finer Points! Please enjoy! This week we visit South Africa and talk with Chris Burger, author of 'Cockpit Procedures' now available from ASA. Chris is an expert in Aviation Psychology and Ergonomics and is working hard to increase safety. Please enjoy The Finer Points! This week on TFP we discuss a couple of the many benefits of using new modern cockpit systems such as the G1000 or Cirrus Perspective. Please enjoy The Finer Points! This week, we'll talk with Ed Pasquale, Flight Line Professor at Seneca College in Toronto, Canada. He is also a contributor to Punkstar Studios who is currently responsible for producing numerous iPhone applications for aviation, diving and more. For more information, search Punkstar Studios in the iTunes Application store. This week on TFP we join Anais Radonich Galvin as she talks with John Fisher, Operations Manager at Oakland Center. Please enjoy The Finer Points! This week we answer a letter from a fan who is concerned about staying current and keeping safe. We look at some options to keep your head in the game while considering the limitations of your current lifestyle. In this safety session we examine an accident report involving spin training and an article in Flight Training Magazine. In this weeks podcast Anais and David Howarth give us a taste of bush flying in South Africa. Please enjoy the finer points. This week we discuss the practice of CFI's pulling the mixture and actually killing the motor during single engine training. Please enjoy The Finer Points! This week we talk with Becky Bock, ASA author and flight attendant extraordinaire. Please enjoy TFP! This week we discuss an accident that happened on a dual training flight. Both the CFI and the student were OK but it brings up a great discussion about the positive exchange of flight controls. This week on TFP we talk with Kevin Query, founder of Sky High Hope, and organization that brings flight simulators in to hospitals. Please enjoy The Finer Points! This week on TFP I'll sing you a song about the FAA ... safety.gov ... that, is. Please enjoy The Finer Points! This week on TFP we address some concerns from the forums. Hear a review of take off callouts, IFR lost comm procedures, and how to fly neighborly. Please enjoy The Finer Points! This week on TFP we're talkin' with the author of the ASA Oral Test Prep guides, Dr. Michael Hayes. These common little books help aviators everywhere make it through check rides where others have failed. Please enjoy The Finer Points! This week we sit down with Steve Benedict, a designated examiner. He talks about common mistakes and has some helpful advice to pass your check ride. Thanks for listening to The Finer Points! This week on TFP we discuss the controversial idea of partial power takeoffs as a noise abatement procedure. In this week's double posting you'll hear part II of the annual Pod a Palooza. Please enjoy! In this episode of TFP we listen to the first half of Pod a Palooza 2008, live from the EAA forums at Oshkosh. This week I join you live from a camp fire at Osh Kosh 2008. This week we respond to TFP aviator, Kiko Lobo, who recently asked about IFR lost comm procedures. To read Kiko's forum post click HERE. Please enjoy The Finer Points! Jim Pitman, the western regional manager of the Cessna Pilot Training Center, joins us this week for a discussion about creating more pilots and putting competition in perspective. Please enjoy The Finer Points! Designated Pilot Examiner and Chief Flight Instructor, Arlynn McMahon, takes some time to discuss the benefit's of scenario based training. Please enjoy The Finer Points! This week on TFP we go over the 10 commandments ... of weather. Please enjoy, The Finer Points. This week we discuss the difference between your best glide speed (L/Dmax) and a speed slightly slower, minimum sink. Please enjoy The Finer Points! This week I address some of the details of the low altitude enroute chart, the difference between, OROCA and MORA ... and how MOCA fits in there. Also, visit the TFP forums for a discussion on the use of 121.50 in search and rescue operations. Learning how to give Pireps is a critical part of flying and is often overlooked in Flight Training. This week on TFP we review the procedure for giving Pireps in flight. Please enjoy The Finer Points! Fly Your Best, Jason Check out "The Aviation Video Podcast by On The Flight Line" in itunes and on youtube. 1947 - The war is over and the aviators are coming home. We are using the knowledge we attained during combat to build a civil aviation system. This week on TFP I thought it would be fun to honor the hereos of yesterday by reading from a 1947 edition of FLYING magazine. Being discussed are the pro's and con's of Ground Controlled Approaches vs Instrument Landing Systems. Enjoy TFP! Be Safe and Fly Your Best, Jason Look for us at OSH! Good decisions keep pilots safe. In this aviation safety session, learn about a recent experience of mine where a turn of events meant the difference between life and death. Sometimes airplanes hit skydivers. This week on TFP we hear from a seasoned jumper and jump pilot. Get tips on how to avoid ever having that happen to you. Thanks to Dave, SkyDive Radio. This week on TFP I go over the seatbelt requirements for Pilots and Passengers alike. Sometimes the details need to be heard over and over again before they stick, find out how well you know what's what when it comes to seat belts. Please enjoy The Finer Points! Three Strikes and you're out. This week on the Finer Points I tell a story about a recent seaplane trip from Vancouver to Saltspring island on the west coast of Canada. We can all learn from each others experiences. Please enjoy The Finer Points. Aviators? Do you copy? This week on TFP we talk about lost comm procedures and some of the specific rules regarding Class D airspace. They're back! Now integrated into the weekly podcasts Aviation Safety Sessions are back in your iPod. This week Anais Radonich Galvin joins me in the studio for a discussion about Go Arounds. Ben Freelove from Tutima School Of Aviation Safety - Sean D. Tucker visits us this week and breaks down the procedure for doing a ballistic aileron roll. Enjoy TFP! This week we discuss 14 CFR 91.213, Inoperative instruments and equipment. What do you do when you find a piece of equipment is not working? This episode of TFP will go through the decision making process required to stay within the law. Please enjoy The Finer Points! This week on TFP I answer an email regarding traffic pattern operations and give some tips on the early stages of flight training. Please enjoy The Finer Points! Is Skywriting a lost art? This week on TFP I answer an email from a listener 'Down Under' who is curious about the lost art of skywriting. Please enjoy The Finer Points! Happy Holidays Aviators. This week on TFP I lay out a plan for those of you planning on pursuing an instrument rating. Learn a methodology that will help bring focus to your training. Enjoy The Finer Points! Understanding the aerodynamic effect of flap application can be difficult for primary students. This week on TFP we are joined, once again, by Torea Rodriguez as we work to uncover the mystery of the flaps. Also, there will be no Aviation Safety Session this month. ATC directives can be challenging, particularly in the IFR environment. Learn to break your approach clearance into components to understand the information you are receiving and hopefully reading back. Turkey Day is getting close and I hope you enjoy The Finer Points! Until next time ... Fly Your Best. This week we continue with landings. Learn specific exercises to improve your landings. Enjoy The Finer Points. This month we review an accident that happened as a result of the pilot not performing weight and balance computations before takeoff. Review the computation and graph method of determining whether or not you are operating within CG limits. Also learn a weight shift formula for when your passengers ask you, "Is it ok if I put this bag in back?". Enjoy The Finer Points. This podcast will help you differentiate the good from the bad during landing analysis. Learn how to divide the landing into five specific segments. Enjoy The Finer Points! AOPA columnist, Greg Brown, joins us this week and gives some advice on how to complete your flights safely. Sometimes the go / no-go decision isn't black or white. This week on TFP you'll hear some tips from an industry expert. This week we talk with Captain Rod from the Civil Air Patrol. Learn techniques that will increase your chances of survival in the event of an off airport landing. Enjoy The Finer Points! This week we talk with Thom Leveque, Northern California Regional Sales manager for Cirrus Design. Thom anwers some questions about the Avidyne Entegra Avionics Suite. You'll enjoy hearing concrete examples of why Cirrus believes the Avidyne Suite is a superior product. Also, hear an excerpt from our High Airwork CD and learn a few tips about Slow Flight. Enjoy TFP! This month we examine a Cirrus Design SR - 20 accident from August. Learn from this pilot's descisions and improve safety in your own flying. This week we listen to in-flight audio of an F-16 intercept and discuss the importance of receiving weather briefings before every flight. Review the different types of briefings and listen to a discussion about the importance of talking to an FSS. Learn a procedure for clearing airspace that will help ensure you do it. Every time! Sometimes the secret to dilligence is having a procedure that never changes. Adopt this procedure for clearing turns and do it the same way every time. Thanks for listening and enjoy The Finer Points. Have you ever failed a checkride? Got Pink? This week on TFP we visit with our friend Lou Fields, a designated pilot examiner for more than 30 years. Lou tells us some of the things to avoid when preparing for a checkride. Also, listen to excerpts from The High Airwork CD as I throw in some of my own suggestions. Enjoy The Finer Points! Mountain Flying Expert Sparky Imeson joins me this week for a discussion about some of the general principles of back country flying. This podcast is a good compliment to Episode 28 and Safety Session 6. This month we discuss Comair flight 5191 and discuss procedures that might prevent departure from the wrong runway. Be safe and fly your best! VFR Diversions are a skill every pilot should have down cold. This week on The Finer Points you will learn the order of operations required for a successful diversion. Practice this procedure before you ever go to the airport and save time and money. Enjoy The Finer Points! I'm married aviators! The wedding was marvelous and we're back to work this week talking about IFR scan techniques. Learn techniques for scanning the instruments when you lose reference to the horizon and learn to avoid the common pitfalls. No lecture this week, aviators ... just my wedding! ... and this John Denver song 4 U.
thanks for listening, we'll resume next week. Hello Aviators! We're back from Oshkosh and this week we're talking to Brian Terwilliger, producer and director of One Six Right. One Six right is a documentary film about the struggle for survival of the Van Nuys Airport. Learn more about One Six Right by clicking here. Well Aviators ... today is my birthday and I've got one to week to go before I get married. It's a great year so far and I thank you for your listening and your support! In this month's safety session we look at an accident that occured recently at Hayward Executive Airport, Hayward California. This tragic accident is a reminder of the dangerous inherent in this sport we all love so much. Be safe! Dynamic Stability refers to stability in pitch around the lateral axis ... over time. This week on The Finer Points we wrap up our discussion of longitudinal stability by going over the three types of dynamic stability. This podcast compliments 'Don't Give Me Static, Stability - Aviation Podcast # 26'. Please remember that next week we are on our Audio Airventure publication schedule of Monday, Wednesday and Friday. We will resume the normal program the week after Oshkosh. Do you perform magneto grounding checks before shutting down your engine? If so, what procedure do you use? This week on The Finer Points we welcome special guest Justin Louw, former Navy mechanic and owner of Oakland Aircraft Maintenance. Justin and I discuss the different procedures for confirming your magnetos are grounding properly. Eleven Days to Oshkosh ... one month to my wedding ... life is good! Enjoy The Finer Points! Density altitude can be an issue for all pilots. Each year pilots from the flatland experience the effects of density altitude on trips to higher terrain and sometimes find themselves in trouble. This week on The Finer Points we have a conversation about the effects of air density on aircraft performance. Enjoy The Finer Points! Departing class C airspace can be challenging if you are not familiar with the required radio procedures. This week we go over the correct procedures when departing class C airspace. One of our newest sponsors, Clarity Aloft makes one of the industry's most advanced headsets. Thanks for Listening and Fly Your Best! In June there were at least two fatal accidents as a result of engine failures. This month we review these as a reminder of the importance of practicing simulated engine failures. Advection fog is the reason the coldest winter you'll ever spend is a summer in San Francisco. This week on TFP we learn about what it is and how it works. Also on this weeks show I introduce the Clarity Aloft aviation headset. Aloft Technologies makes one of the industries best headsets. AOPA columnist, Greg Brown, talks with me this week about the joy and freedom of flying. Listen while we discuss one of aviation's biggest mysteries - why do pilots spend so much time and money in training and stop flying when they get their ticket? Greg writes a column called, Flying Carpet, for AOPA's Flight Training magazine. Break radio silence! Learn proper communication techniques in a non-towered environment and contribute to flying safety. Review common traffic advisory procedures with this podcast and enhance your skills. Last night there was a beautiful full moon over the bay and I am looking forward to an awesome summer. Almost one month to Oshkosh and two months to my wedding! Wow. Thanks for listening. This week on TFP we talk to Gordon Henrie, a teacher to teachers. Gordon's book, "Instructional Methods For Flight Instructors" is full of invaluable knowledge gathered over 50 years of flying. Also, at the request of a listener we address tipping practices as they relate to line service personnel. In 1996 a Gulfstream G-IV crashed at Palwaukee Municipal Airport. This month we discuss the importance of communication in a two-crew environment. Learn from this accident and improve your flying safety. IFR flying is some of the most challenging flying you will do. To be prepared for it you have stay ahead of the airplane. This week we take a fresh look at using the 5 T's. Even if you are a VFR pilot you benefit from this podcast. Hello TFP listeners! This week on The Finer Points we talk with Wright Bass, a local contract pilot who has had experience as a CFI, a cargo pilot and an airline pilot. Wright tells us how flow checks and dry time can really help with check rides at any level. Also, a reminder that the TFP / Zuluworks open house is one week from today at 3180 17th st., San Francisco. There will be music, snacks and us. :) The party starts at 7pm ... see you there! Learn the communications procedures required to transition Class B airspace. Hear in flight audio of an actual bravo transition. Often Private Pilots are not comfortable with complex airspace because as students they are taught to avoid it. Learn procedures that will make you a safer more versatile pilot! If you are a bay are listener click here for information about the Finer Points / Zuluworks open house, Thursday May 18 at 7:00 PM. Mountain flying can be challenging. Avoid making the mistakes I made as a young instructor. This month's Safety Session is a story from my experience that will help improve safety in the community. Enjoy The Finer Points! Listen to in-flight audio and learn the proper techniques for filing VFR flight plans. Search and Rescue is a free service offered to pilots. Unfortunately, in VFR flying it is rarely used. Perhaps this is because pilots are not familiar with the filing procedures. Well ... worry no more! This week's podcast clears that up. Enjoy The Finer Points. Hello aviators! I'm back from Sun N Fun and I couldn't help posting a file about one of my favorite industry magazines, FLYING. FLYING was founded 1927 and is currently distributed to more than 1.3 million readers making it the most widely distributed aviation magazine in the world. This is a nod to aviation's oldest and most trusted source of information. Enjoy The Finer Points! Static Stability is what we're dealing with this week on The Finer Points. We are going to work on The aircraft's initial tendencies in longitudinal stability. Look for a podcast on dynamic stability to follow. Oh, I look up to the sky! Hi Friends, this week the whole industry is getting ready to head off to Sun N Fun in Lakeland Florida. On this episode of the The Finer Points we talk with Max Trescott, speaker at Sun N Fun and industry expert on the G1000. Max shares some insight into the benefits of glass cockpit systems and how to learn them. Enjoy The Finer Points! Own Your very own G1000 Book! The G1000 Book is now on sale in our store. You can Help support The Finer Points and learn how to use the G1000! Our Pilot Shop is located here. Hi Friends, this week we discuss the proper techniques for cleaning your aircraft windshield. Using information provided by LP Aero Plastics, we get to the bottom of which cleaners are the best to use on acrylic plastic windshields. Enjoy The Finer Points! Well friends it was great talking with Lou and there will be more of that to come, but it's back to work this week on The Finer Points. This week I discuss checking the electrical system prior to takeoff. Learn a system that will help you be sure that you leave the ground with a healthy electrical system. Fly Your Best! Hi Friends this week we take a look at the flippers and fins ... ailerons and rudder that is :) Learn why you need more rudder with faster roll rates. This week I'm going to give you a flying procedure that will help you capture and hold altitude when leveling off from a climb. We're going to talk about how the trim tab works and why pitch, trim, and then power is the desired order of operations. Whether you are flying for fun or enrolled in flight training, this weeks lecture will give you a procedure to be sure you have checked everything during taxi. Take notes and use these call outs to enhance your flying safety. Hi friends ... Happy Thanksgiving! This year I am thankful for so many things! My beautiful fiance, Jessica, has a turkey in the oven and we are with some of our closest loves. I hope you are having a wonderful, blessed day....But when you're done with dessert get your pen out and take notes because we're going to work this week on The Finer Points. In this episode I speak to the point of using call-outs in your flying. Give yourself procedures that will make your flying safer. Hi Friends ... my co-producer Raleigh, Rob from Zuluworks and myself flew down to check out the podcast expo last week and were interviewed by Macworld! I was trying to get some remote recording tips off of a guy with some really cool recording equipment and next thing I know he wants to talk to us! You can hear that interview at http://www.macworld.com/2005/11/downloads/mwpodcast14.mp3 Thanks Cyrus :) In this weeks lecture I give some tips on how to measure the quality of your work as a CFI. Tips and tricks for students to bring to their CFI and vice versa. Enjoy! In This episode of The Finer Points I unravel the mystery of the stall / spin accidents that have occurred during the base leg as the pilot turns onto the final approach. Don't make the same mistakes hundreds of others have made. Enhance your flight training by listening to this lecture. Hi everybody! Welcome to my aviation podcast. This is an educational series about the fine details of flying. In this episode I introduce myself . In this medium I am able to blend my love of music with my love of flying. Enjoy the Finer Points!